Bewildered so far by the 28 meters high walls of GuimareasCastle, (Cradle of the Portuguese nation), by the greatest Cistercian church in Europeand by Obidos, one of the most preserved medieval towns on the continent? 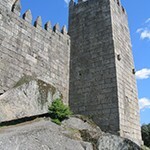 Then you will appreciate the remaining Seven Wonders of Portugal: Batalha’s Monastery, Jeronimos Monastery,Pena National Palace and Belem Tower. In a time of kings, glory and fierce wars, the bond between man and God was stronger than ever, reaching an impressive level. Batalha’s Monastery stands as a witness for the promise that King Joao made to Virgin Mary for the victory against the Castilians. 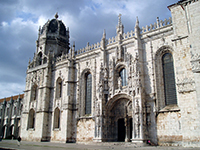 Also known as Mosteiro Santa Maria da Vitria, the monastery is a Dominican convent built between 1386 and 1517. Its pituresque consists in the mixture of Gothic style elements with Manueline embellishments that astonishes the eyes of the tourists. 32.4 meters high and 22 meters long, this fascinating piece of architecture was listed by UNESCO as a World Heritage. The marvelous and courageous adventures of Vasco da Gama, the XVIth century Portuguese explorer that sailed directly from Europe to India, are known all over the world. Symbol of the Golden Age of Discovery, Mosteiro de Jer?nimos represents the place where Vasco Da Gama and his fellow men spent the last night before leaving forIndia, in 1497. The monastery also holds the tomb of Vasco da Gama. The construction of this impressive monument took 50 years, from 1501 and it was dedicated to Virgin Mary as a gratitude for Da Gamas’s successful voyage toIndia. Combining the unique Portuguese Manueline style (massive sculptural details and maritime motifs like sea monsters) with Gothic elements, the Monastery completes the list of Portuguese monuments, recognized as a World Heritage Site. Magnificent, breathtaking and sumptuous, Palácio National da Pena (Pena National Palace) is without any doubt more than just a palace, raising the curiosity of thousands of tourists every year. Pena National Palace stands on top of a hill, 450 meters above Sintra town. Representative of the 19th century Romantism current, the Palace was actually built by King Ferdinand the IInd on the ruins of a monastery, destroyed during the 1755 Great Lisbon Earthquake. The architecture of the Palace combines Neo-Gothic, Neo-Manueline, Islamic and Neo-Renaissance styles. Surrounding the palace for more than 200 hectares is PenaPark, a quiet and relaxing green oasis, home to various exotic types of trees, from North American Sequia, Chinese Ginkgo to Australian andNew Zealand vegetation. 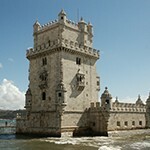 Belém Tower or the Tower of St. Vincent played, together with Jeronimos Monastery, an important role in the history of Portugal, remaining a symbol of the Golden Age of Discoveries. 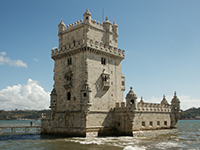 Built in 1515 under the order of King John the IInd, to protect Lisbon’s harbor, Belém Tower embraced the same architectural style as Jeronimos Monastery, the monument being an exquisite example of Manueline style (integrating stonework motifs of the Discoveries or historical figures such as St. Vincent). Belém Tower represents an icon for the Portuguese nation and is definetly one of the most known touristic attractions of the Seven Wonders of Portugal, so you might want to pay it a visit! I hope you have been convinced that Portugal is far from being an ordinary country, these seven wonders presented being only a few of the magical places that one can discover while traveling in the western part of the Iberian Peninsula. 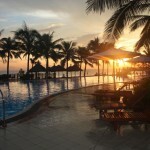 Stop wasting any time and plan your first holiday toPortugal, now!